Thanks to the enterprise of a small automobile manufacturer, Turbomeca, which had developed a family of small turbojets, the first French jet-propelled helicopter was also built in 1948 by Sud-Ouest. A jet-propelled helicopter had already been developed by von Doblhoff, the reciprocating engine of which drove a compressor which sent the fuel mixture to blade-tip nozzles through the hollow rotor blades. Having ruled out direct use of the jet of a 220 hp Artouste turbine, this was used on Ariel models SO.1110 and SO.1120 for the direct drive of a compressor which fed air through the hollow rotor head and spars to burners at the tips of the three blades. The residual thrust from the turbine was used for yaw control at low velocity and in the hover, while at higher velocities, the rudder was used. The SO.1110 was a two-seater, while the SO.1120 carried three. 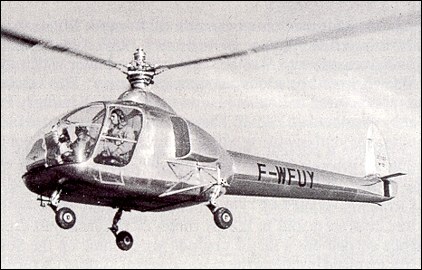 Early company interest in the development of rotary wing aircraft led to design and construction of the Sud-Ouest S.O.1100 Ariel I, an all-metal helicopter with an enclosed cabin for two. The company had sought simplicity by the use of a single three-blade torqueless rotor, driven by tip jets. Thus its powerplant comprised a 164kW Mathis G8 engine driving a Turbomeca compressor, providing low-pressure air which was fed through the hollow rotor blades to the combustion chambers of the tip jets, where the air was mixed with fuel and ignited electrically. In its original form as the Ariel I, first flown in 1947, the helicopter had a stubby tail boom incorporating twin vertical surfaces. The improved S.O.1110 Ariel II, flown on 23 March 1949, was of generally similar configuration but had revised twin tail surfaces. However, the two-unit powerplant of these first two prototypes was heavy, and in the improved S.O.1120 Ariel III it was replaced by a much lighter weight 205kW Turbomeca Arrius turbine-compressor unit, the weight saving making it possible to accommodate an additional passenger. The Ariel III also differed from its predecessor by having a tail unit that was basically a single fin and rudder, but supplemented in its steering capability by the efflux from the turbine. This was ducted to the tail and could be discharged on either side under the control of deflector vanes coupled to the conventional rudder. 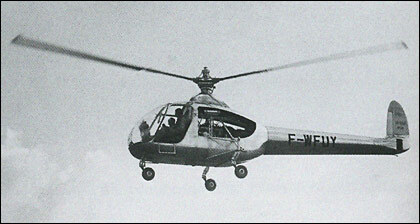 The Ariel was not to be built as a production helicopter, but the data gained from this powered rotor system was to be of value in development of the S.O.1220 Djinn. Three-seat all-metal helicopter with fixed tricycle u/c and one 275shp Turbomeca Artouste turbine driving rotor-tip propulsors via an air compressor, first of two Prots. F-WFUY FF 18 Apr. 1951.
system was to be of value in development of the S.O.1220 Djinn.